Adolphe Quetelet was a mathematician, astronomer, statistician, poet, dramatist, and one of the founders of sociology. He was the first person to apply the statistical normal distribution to characteristics of human populations and he introduced the height-weight measure we know today as the body mass index. Lambert Adolphe Jacques Quetelet (pronounced Ket-eh-lay) was born into a middle-class family on February 22, 1796. He was born in Ghent, France. The city is now in Belgium. Adolphe’s mother, Anne-Françoise Van de Velde, was Flemish. His French father, François-Augustin-Jacques-Henri Quetelet, had, when young, moved to Britain where he became a British citizen. He had toured Europe for 10 years as secretary to Lord Cahir. By the time Adolphe was born his father was prospering as one of Ghent’s municipal administrators. Adolphe was the fifth of nine children, several of whom did not survive infancy. His father died when Adolphe was seven. Adolphe was educated at Ghent’s Lyceum, where he excelled in mathematics and languages. In 1813, at age 17, he began teaching mathematics at a private school in Oudenaarde about 20 miles from Ghent. At age 19, Adolphe Quetelet became a college mathematics instructor. Although he was making a living teaching mathematics, Quetelet was intensely interested in literature and the arts. In 1816, he and his former high school friend Germinal Dandelin wrote an opera, which was performed in Ghent. They followed this success with two dramas. Quetelet had his poetry published, and he translated tales of chivalry from English, German, Italian, and Spanish into French. In October 1817, the University of Ghent opened its doors. 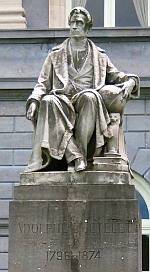 Quetelet was one of its first students, graduating in 1819 with a doctorate in mathematics – the first doctorate awarded by the university. His dissertation demonstrated new propositions about conic sections. Soon after graduating, Quetelet, age 23, was appointed chair of elementary mathematics at the Athenaeum in Brussels, and at age 24, he was elected to the Brussel’s Royal Academy of Sciences and Literature. Brussels became his permanent home. Adolphe Quetelet’s lifetime and the lifetimes of related scientists. In 1767, John Michell used probability analysis to suggest star clusters are held together by gravity. In 1801, Carl Gauss unleashed a torrent of new mathematical techniques, including statistical error analysis, enabling the lost dwarf planet Ceres to be rediscovered. Quetelet returned to Brussels early in 1824, full of zeal for statistics. He was promoted to chair of higher mathematics at the Athenaeum and soon he was searching for data he could analyze statistically. Society itself looked like a promising topic. In 1826, Quetelet published a paper analyzing birth and mortality statistics in Brussels, and he proposed a comprehensive population census be carried out. The government ordered this in 1828. Meanwhile, Quetelet continued with astronomy research and, in 1828, he was appointed director of the still-under-construction Brussels Observatory, finally completed in 1832. Quetelet believed society could be analyzed without bias using statistics. He described this new academic field as social physics, believing it would reveal important patterns in human society. He expected these patterns to be as regular and predictable as the movements of astronomy’s heavenly bodies. He hoped social physics would identify the factors driving phenomena such as crime and suicide. In time, social physics became sociology. Florence Nightingale advocated sanitary reforms that improved average life expectancy in the UK by 20 years. Quetelet was aware that, unlike the heavenly bodies, society’s patterns could be changed by interventions, by governments for example. Certainly when governments took their country’s into great wars or there were revolutions, society changed. Quetelet hoped his social physics would give governments evidence for rational social policy decisions. Quetelet’s work was welcomed in the United Kingdom, where he was a driving force in founding the Royal Statistical Society. His enthusiasm for utilizing statistics to improve society inspired Florence Nightingale, the Society’s first female member. Nightingale employed statistics to advocate sanitary reforms credited with improving average life expectancy in the UK by 20 years between 1871 and 1935. In 1831, after studying three years’ of crime figures, Quetelet wrote that the numbers and types of crime were so regular that they could be predicted in advance. Quetelet said crime figures were related to social conditions, hence figures would change if conditions changed. This stirred up controversy. It seemed to many of his readers that Quetelet was casting doubt on the existence of free will. 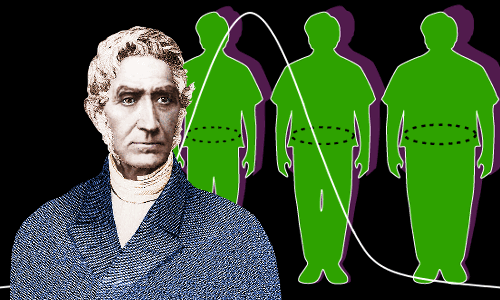 In 1832, Quetelet discovered in his mountains of data a relationship between height and weight in adults. With these words the Quetelet Index was born. In 1972, the American physiologist Ancel Keys formed the view that the Quetelet Index was the best way to identify obese individuals and gave it a new name – the body mass index. A ‘normal’ weight person should have a BMI of 18.5 – 25. In 1835, Quetelet returned to the predictability of human characteristics in his highly influential book Treatise on Man. In it he noted the regularity of statistics for large numbers of people. His crime figures showed the peak age for male criminality was in the early 20s and that males committed more crimes than females in a ratio of 4:1. Again he linked crime to social conditions. Quetelet analyzed influences on human mortality, social prosperity, intellectual development, height, weight, strength, etc., and noted the regularity of his findings. 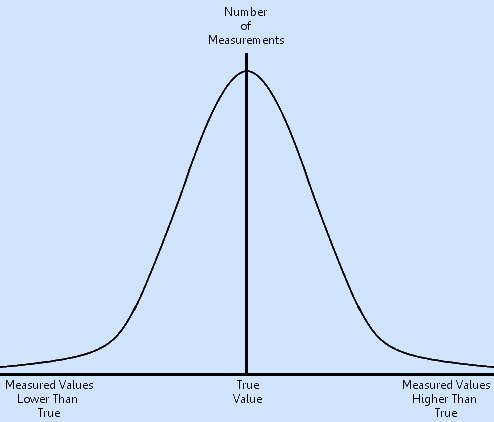 In 1844, Quetelet showed that the distribution of many easily-measured human attributes, such as height, could be plotted to yield a bell-shaped curve symmetrical about the average (mean) value. Today, statisticians call this curve the normal distribution. In Quetelet’s time, the shape of the curve was already well-known to astronomers as the error law. Quetelet was the first to use the normal curve to characterize human populations rather than as an error law. Until Quetelet began his social physics, the normal distribution had routinely been called the error law. Scientists, particularly astronomers, used it to estimate the true value of a measurement. Plotting the number of measurements versus the measured values produced a bell-shaped curve peaking at the true value. Quetelet demanded that before being put to use in the real world, statistics should be both moral (reliably sourced) and material (mathematically robust). He believed statistics outside these requirements could be dangerous. In September 1824, age 28, Quetelet married Cécile Curtet, the highly cultured, musically gifted daughter of a physician. They had a son, Ernest, and a daughter, Marie. Quetelet’s statue in Brussels. Image courtesy of Klever. In the summer of 1855, age 59, Quetelet suffered a stroke. He returned to work after a few weeks, but was never the same again: his memory was unreliable and his formerly rapier-like intellect lost its edge. Formerly well-known for his convivial and jovial personality, he became more introverted. Quetelet was stunned by the loss of his wife Cécile, who died in 1858, age 57, and then his daughter Marie, who died in 1860, age 34. Adolphe Quetelet died age 77 on February 17, 1874 in Brussels. Survived by his son Ernest, who had followed in his father’s footsteps to become Director of the Brussels Observatory, and by grandchildren from both Ernest and Marie’s marriages, he was buried in the Brussels Cemetery. In 1880, a statue of Quetelet funded by popular subscription was erected in Brussels. "Adolphe Quetelet." Famous Scientists. famousscientists.org. 20 Jul. 2018. Web. Image of Quetelet’s statue courtesy of Klever under the Creative Commons Attribution-Share Alike 3.0 Unported, 2.5 Generic, 2.0 Generic and 1.0 Generic license.